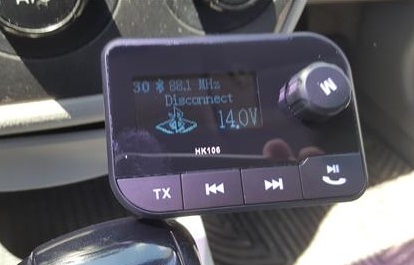 If you have a car radio that doesn’t have Bluetooth built-in there is an easy low-cost way to quickly make it Bluetooth ready. 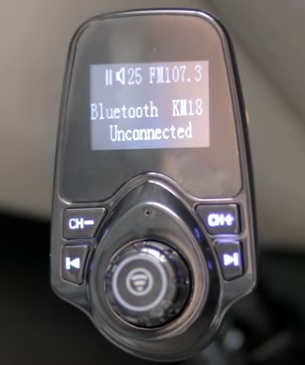 It is an easily fixable problem with a Wireless Bluetooth FM Transmitter. FM transmitters allow for hands-free calling and playing music from Bluetooth devices such as a smartphone. Most all will plug into the cigarettes lighter socket and come with extra ports to plug in your phone. FM transmitters are universally compatible with most any FM radio. The setup is easy by placing both the transmitter and radio to the same empty FM station. 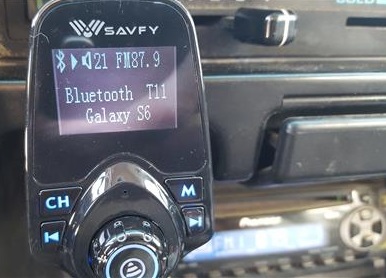 After both are set to the same radio station a smartphone is Paired to the device via Bluetooth, and any sound will come from a vehicles speakers. A wireless FM transmitter will easily pair with a smartphone via Bluetooth and play music or make and answer phone calls. 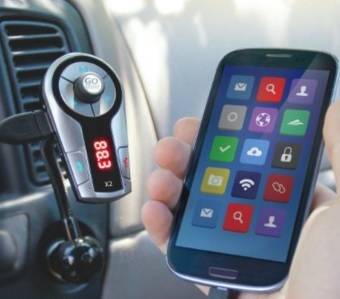 So What is the Best Bluetooth FM Transmitter? With the many units to choose from and different layout and styles this is definitely a personal choice. One person may need more USB power ports while someone else like the button configuration on a unit. 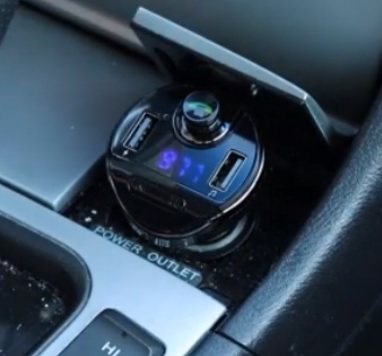 With that in mind here is our picks for Bluetooth FM transmitter units of 2019. As always be sure to read the reviews on Amazon, here, or elsewhere to be sure a unit is a good fit for you. 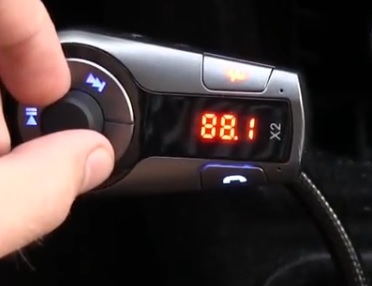 Criacr makes this popular wireless Bluetooth FM transmitter. It pairs easily with a smartphone and can make hands-free calls or play music. It is a stubby unit so be sure the cigarette lighter is not deep in a console and able to fit in place. The setup is easy to do by setting the unit and a car stereo to the same empty FM station. A smartphone is then paired to the unit which will transmit over a vehicles speakers. A built-in Mic allows any words spoken to be heard during calls. This nice unit from SAVFY has built-in 1.44 inch LED display which is nice to use while night driving. The buttons are well laid out and big which makes it easy to use. It is compatible with most any smartphone available android and iPhone. 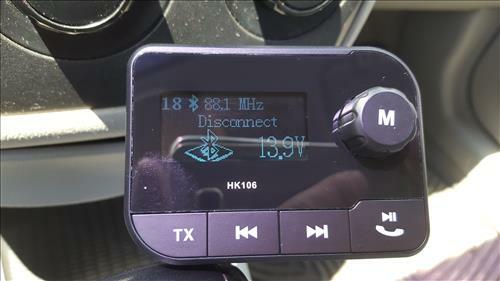 Like most FM transmitters it is a low cost device that will make a non-Bluetooth radio, Bluetooth ready quickly and easily. The HK106 is a good low-cost unit that works very well. It has a 2 inch display, built-in microphone, SD-card slots, 2 USB ports, and a 3.5mm audio line-in for any non-Bluetooth device. The hands free calling works nicely along with playing music from a smartphone or from a SD-Card. It is a low cost unit that is a good buy for those on a budget and looking to upgrade a car stereo. GRDE makes this small unit that is compatible with android or iPhone. It has a long cord that allows it to be located in the best spot for the user. A 2 port USB charger comes with the unit to get power which leaves one port open to charge other devices. It is a good unit for those with the cigarette lighter located in a out-of-the way spot such as a center console. The Geartist GB01 is a good unit and comes with all the necessary things to have Bluetooth wireless in your car. It has a cord so is very movable and can be located much easier than other units. The GOgroove FlexSMART X2 is a sleek model with everything you would expect from a wireless FM transmitter. The buttons are nicely laid out with call/end call buttons for answering the phone, and of course volume, play, pause, next song buttons. The LED lights up nicely at night making it easy to use. 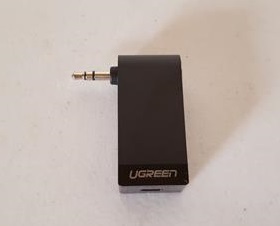 For those who have an Aux audio line-in on a car radio, Ugreen gives a nice Bluetooth solution. Unlike other units that transmits with FM the Ugreen plugs straight into a 3.5mm audio jack and then paired to a smartphone. This is a good option when there are many radio stations in a area which sometimes can cause interference. Interference happens more for those who are traveling and a radio station comes on over the open one set to a FM unit. A new empty frequency can easily be found but the Ugreen stops this by plugging straight into a 3.5mm Aux audio line-in. Not all radios have a 3.5mm line-in so be sure yours does or one of the standard options above would be better. It has a built-in mic for hands free calling and a built-in battery that last 4 hours. A micro USB charger can be left plugged in if longer play time is needed. If your car stereo needs a Bluetooth upgrade there are many low cost kits to make it ready. Having a car radio able to answer calls and play music from your smart devices is a nice option to have. When looking for a unit be sure to note where the cigarette lighter is located in your vehicle as to get a good fit for the unit. Some cigarette lighter locations can be located in a way that some will not plug in correctly or be hard to get to. Units with a long cable to plug in and than be placed in a good spot would be better for such vehicles.